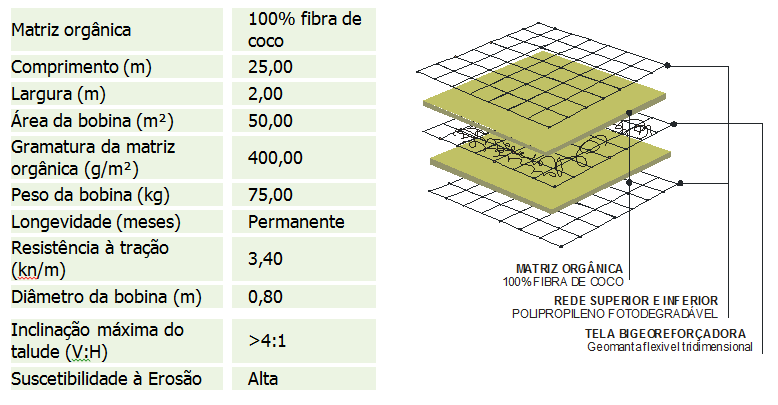 Product: Tridimensional geotextile consisting of coconut fibers (F) and a net of polypropylene fibers of high strength and durability. 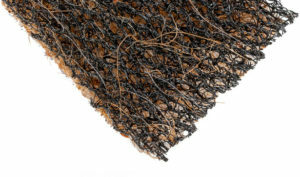 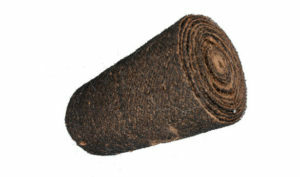 This product consists of two unidimensional coconut fiber biodegradable blankets, which are industrially sewn along the tridimensional polypropylene geoblanket, forming a sandwich, with a biodegradable blanket on top and one at the bottom, allowing to maintain the strength and durability characteristics of the product, aside from maintaining moisture, protection from sunlight, thus contributing to the vegetation development. 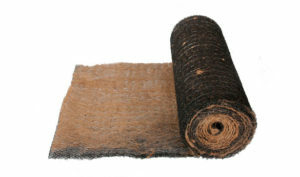 Applications: special projects to minimize large scale environmental damage, bioengineering projects, waterway and hydraulic dam margin protection, highways, railways, airports, polyducts, high flow drainage, mining operations, swamps, marshes, slopes, landfills (any gradient), soils with great susceptibility to erosion, protection of sanitary landfill, industrial wastes, and eroded slopes.